Robometricschool. - This is one of the best circuit design software free called with KiCad EDA Circuit Design for Windows, MAC OS X, and Linux. This software offer you to create circuit schematic project and PCB layout design and printed it easily. In this time, we will give you global description about this free circuit design software and the last we will give you link to take free download KiCad EDA Circuit Design for Windows, MAC OS X, and Linux from original site. This is circuit design software for you who want to design electronic project easily and freely. From Listoffreeware site describe that KiCad EDA is a cross platform circuit design software for Windows, MAC OS X, and Linux. 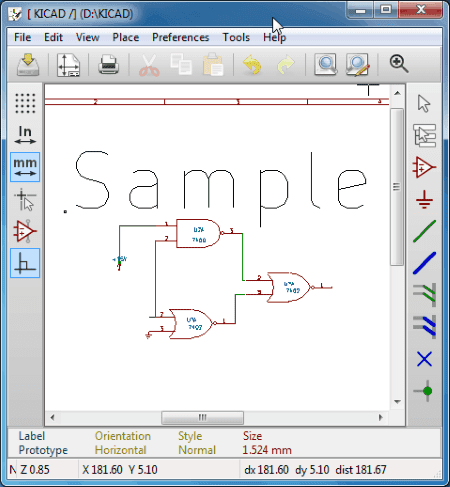 You can create a new project and open the Schematic Editor to design a circuit you will have. Opening a new project creates a new directory. Go to the Schematic Editor tab and begin designing. Click on the Place Component option to select a part and place it on the designing area. These components include: Microchip, Memory, Display, Audio device, Xilink, Power, Transistors, DSP, and many more. Add more components like: Ground, Wire, Bus, Junction, etc. to connect the main components. And now you can click link below to take free download KiCad EDA Circuit Design for Windows, MAC OS X, and Linux from official site.